A blaze that gutted two cars and a pickup truck at an apartment complex in Escondido early Wednesday morning reignited nearly four hours later. ESCONDIDO – A blaze that gutted two cars and a pickup truck at an apartment complex in Escondido early Wednesday morning reignited nearly four hours later. 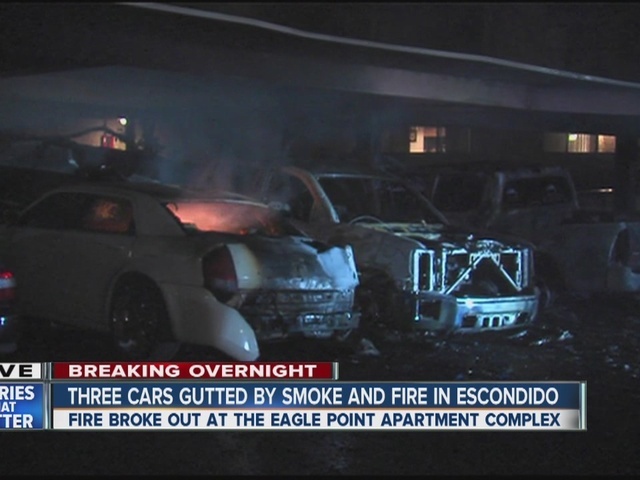 At around 1:10 a.m., Escondido Fire Department crews responded to the Eagles Point Apartments in the 1500 block of East Grand Avenue to find three vehicles parked under a carport ablaze. Some embers also flew and landed onto a tree, starting a small fire. It took firefighters about 20 minutes to contain the flames. The fire didn’t spread to any buildings. Several more nearby cars were damaged. However, at around 4:30 a.m., one of the three cars reignited while 10News was on the scene. 10News Photographer Steve Cox attempted to put out the flames with an extinguisher, but was unsuccessful. Firefighters returned to the scene and put out the fire again. There was no word on the cause of the initial fire. EFD is investigating.